Daybreak above the beginning of Impassable Canyon. The open hillsides of the Flying B Ranch are in the center of the image. 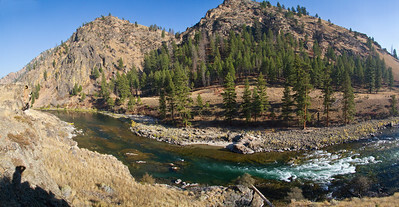 A seeping panoramic view of the Middle Fork as it slips past Wilson Creek, Grassy I & II Camps and turns downstream towards Rattlesnake Cave. Sunrise peeks over the imposing wall of Impassable Canyon. 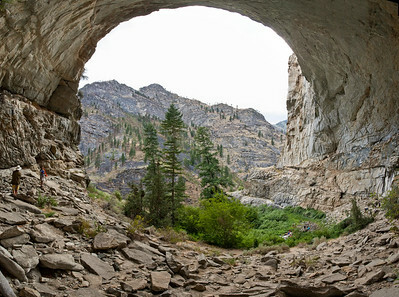 Vail Cave can be seen in the shad at the bottom middle of the image. 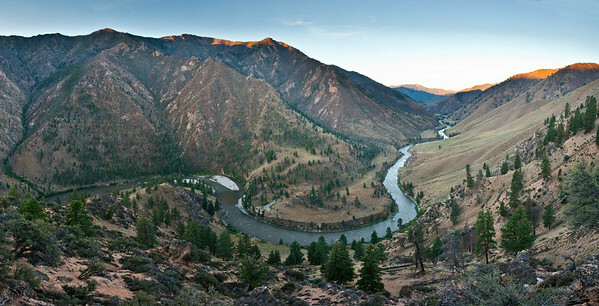 Wildfires have resulted in many landslides that have impacted the Middle Fork river channel. 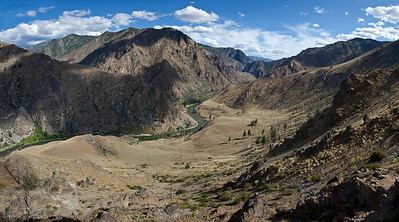 This view is looking down onto two different slides below Sheepeater Camp. Looking downcanyon onto the Survey/Woolard turn from the overlook above Rattlesnake Cave. An afternoon view onto Survery Camp from the cliffs behind Wollard. Looking down on to the broad grassy benches above the appropriately named Grassy I and II camps. Corners and Cracks - the angluar wall opposite Cliffside Camp hosts an outstanding finger crack right out of the water. A view across Cutthroat Cove pool from under the alcove. A relatively green June perspective of Stoddard Creek and Otter Bar Camp. A secluded gravel beach on the lower gorge of Loon Creek (upstream from the hot springs). Muddy River from Mist Falls overlook. Eroded Idaho Batholith boulders in the bed of Loon Creek. A view of the low-water entrance to Pistol Creek Rapid. A sweeping view from a grassy bench accessed from the Mist Falls hike in the Impassable Canyon. 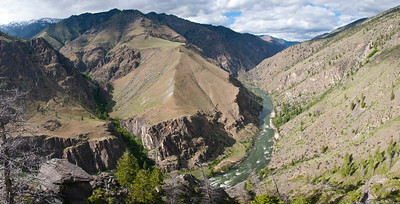 Looking upstream over the entrance to Pistol Creek Rapid. 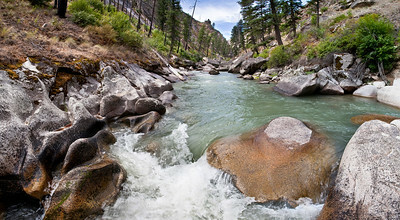 Orleano Creek Rapid (aka Oreo) in Pungo canyon at low water. A photographer composes an image above Underwater Canyon. Getting ready from a Trombone serenade inside Vail Cave. A group enjoys a day-6 lunch at Solitude Camp in the Impassable Canyon. Sunrise from a high ridgeline above White Cox Camp. The ever-shifting gravel bars below White Cox Camp.